Torres’ Hit on Hossa: How does it live up to other big NHL Suspensions? Here is a video of Torres’ nasty shoulder hit on Hossa in the Coyotes vs. Blackhawks 4/17/12 playoff game . Torres got a 25 game suspension for this hit. Even though this is a injury-causing shoulder hit, 25 games is a long time. This ensures that Torres will not play until part of the way into next season (and he will definitely miss the rest of the playoffs this year). I was left to wonder if I have ever seen such a long suspension in the NHL. I did some research and there were some (but not many) suspensions that were for 20+ games (only 5 in total that were for 25+ games). Needless to say, the video footage is hard to watch. I was surprised to see how much these suspension-causing penalties differed. Torres got in trouble for throwing his shoulder into an illegal hit, but some of these other suspensions were caused by punching, cross-checking, slashing to the face, and even an attack on a referee. Check out the hit that ended Steve Moore’s career and got Todd Bertuzzi suspended from March 2004 until August 2005. 30 games is the highest number of games a player has ever been suspended for. That record goes to Chris Simon of the NY Islanders for stomping on the leg of Jarkko Ruutu. Chris Simon also got a 25 game suspension for slashing Ryan Hollweg in the head. This might be the worst one to watch. Ouch. And lastly, the only player who was suspended from the NHL for life was Billy Coutu of the Boston Bruins in 1927. He started an all-out bench-clearing brawl in Game 4 of the Stanley Cup Final when he attacked two of the referees (yes, tackling was involved). The NHL ban was dropped after a couple years, but Coutu never played again. Unfortunately for all of us hockey fans, there is no footage of this event (considering it was in 1927). And just to put that in perspective, that was 2 years before there were any rules about off-sides in the NHL. Do you think the Torres suspension was fair? Should he have received 25 games? Now we just have to wait and hear if Torres is going to appeal his suspension. In Las Vegas, on June 20, 2012 the newest NHL awardees will be crowned. Various trophies will be awarded to both players and coaches throughout the league. Although there is still a decent amount of hockey left before June, here are some of my predictions for who could be winning the prestigious James Norris Memorial Trophy (for greatest all-around defenseman) and why. Front-runner: Shea Weber (Nashville Predators). Benefits of Weber: He is on track for career-best offensive numbers (only two points away from his final regular season point total from last year when he was the runner-up for the Norris). Weber is a major leader for the Predators team as Captain. He is also highest scoring defenseman on the Preds and plays a solid average of 25 minutes of ice-time per game. And we all know Weber has a ridiculous slap shot (we saw just how fast during the NHL All-star Skills Competition when he shot over 104 miles per hour and gave Chara a run for his money). Agree/disagree? Anyone think Letang has a chance even though he was out with injuries for so long? The other two teams with major 3rd period comeback wins on 1/31/12 were the Boston Bruins and the Pittsburgh Penguins. The black and yellow really seemed to be rocking the 3rd period last night! The Bruins had a strong scoring streak near the end of the game to make them victorious against the Ottawa Senators. The Bruins started off strong with the first goal of the game (A power-play goal courtesy of Chara’s monster slapper from the blue line). The end of the 1st and the 2nd didn’t go as well for Boston. They were trailing 3-1 until the last minute of the 2nd when they started to make their comeback. Their last goal was scored with 12:51 left in the 3rd period to make the game 4-3 which ended up being the final. The Penguins game was equally exciting with Pittsburgh coming back from a 4-1 deficit in the 3rd period. The game ended in a tie at 4-4. This tie was made when Center Evgeni Malkin scored the Penguins 4th goal with 0.6 seconds left in regulation. OT went scoreless and Malkin was the only one to score in the shootout to gain the Pittsburgh win. Many Toronto fans were very angry with the outcome of this game because of a re-called goal from the first two minutes of play. Officials said Lupul was penalized for goaltender interference- and I have to say, I did not see what the officials saw. 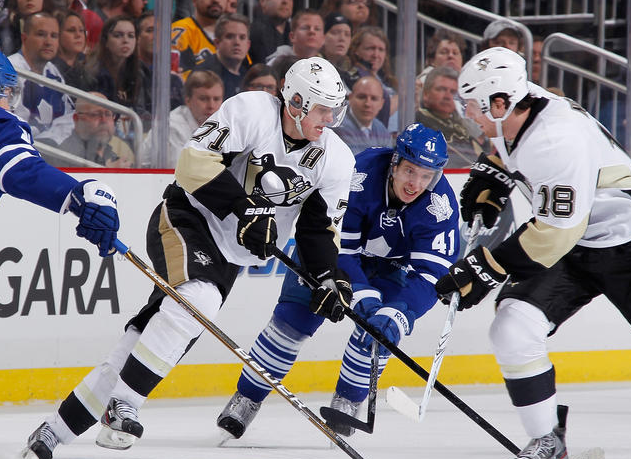 Do you think the Pens deserved that win against the Leafs? 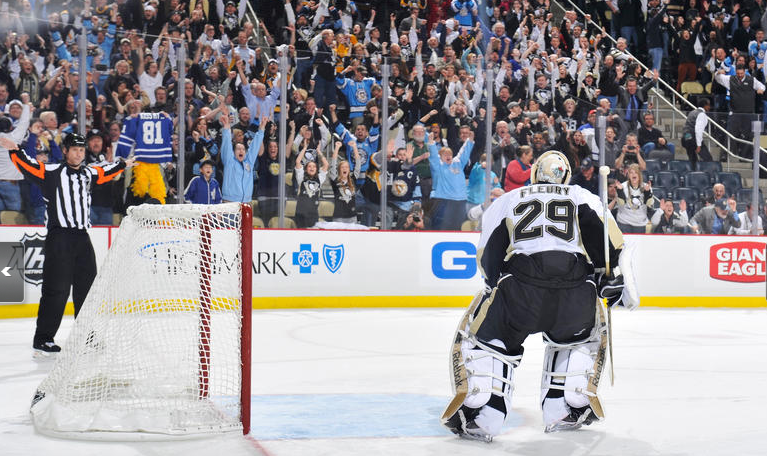 Is Malkin getting enough credit from the news and the NHL for what he is doing for Pittsburgh? Does anyone see the supposed goaltender interference? Tim Thomas exercises his rights, but does he take it too far? 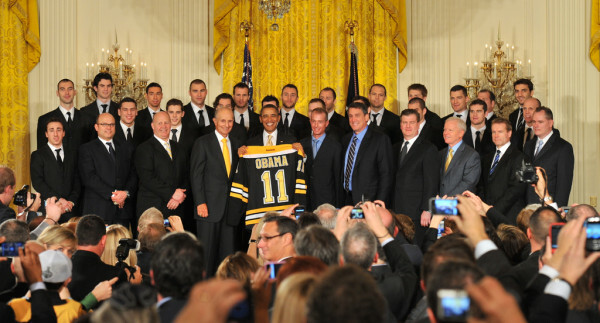 What is missing from this picture of Obama with the Stanley Cup Champion Boston Bruins? The answer, the team’s all star goalie: Tim Thomas. “I believe the Federal government has grown out of control, threatening the Rights, Liberties, and Property of the People. Is it just me or does this comment seem tremendously crafted? And what does it really mean for the Bruins and the NHL? For the Bruins, Thomas’ political views completely overshadowed the purpose of visiting the White House. The White House trip was meant to honor the Stanley Cup Champions for their on-ice success as well as their extremely successful charitable endeavors off the ice. Does anyone hear about this in the news? No. What do we hear about? Tim Thomas trending on twitter. Thomas should have thought about the implications on his team before using social media to promote his own political views. Although the goalie’s decision was not necessarily fan-friendly and was highly controversial, Tim Thomas is still allowed to “exercise his right as a Free Citizen” and make the choice not to attend the White House. Everyone is free to express their political beliefs in the US however, there is a difference between political viewpoints being pushed on and off the ice. Thomas’ decision to not attend the White House might not be widely supported (especially for a visit that does not have to do with politics) but it is within his right to make that decision. On the other hand, the NHL should formally denounce Thomas’ helmet adorning the tea-party mantra, “Don’t Tread on Me”. Regardless of any personal political leanings, the idea of mixing hockey and politics on the ice seems wrong. Everyone comes together through sports regardless of politics, race, or creed. By letting an influential player like Tim Thomas get away with broadcasting his politics on the ice, we are damaging the all-encompassing community created in the hockey arena. If all NHL players took the mindset of Tim Thomas, what would happen in the world of hockey? Would we see players with Presidential candidates’ names wrapped around their hockey sticks? What if the mic’d players in 24/7 decided to talk about their support of a bill right after they drew a penalty? 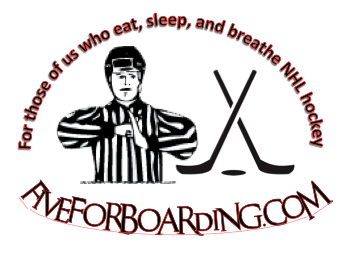 Okay, this might be a bit extreme and insanely unlikely, but the NHL should issue some type of fine in order to separate on-ice hockey and personal viewpoints of the American government! They have a brand to protect so, what are they waiting for?